We at Startup Oasis have been working towards building a cohesive ecosystem for entrepreneurs in the state of Rajasthan. With this context, we have designed an on-demand startup support program called Innocity to enable different entrepreneurial ecosystem stakeholders to offer support to startups. 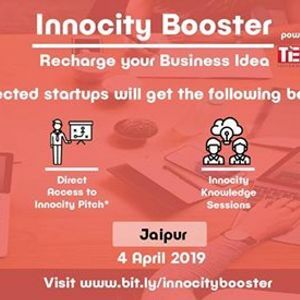 With this context, Startup oasis & TiE Rajasthan are organizing Innocity Booster Jaipur in which is a monthly support program for early-stage entrepreneurs from across Jaipur region on 4th April 2019, to support and empower regional startups by providing rigorous feedback, business clinics, access to Innocity pitch and Knowledge sessions. Innocity Booster is not a demo day. You will also not be expected to pitch your idea for raising funds. Instead, you get to chisel and sharpen your business idea by pitching to a select panel of founders, industrialists and domain experts from your city - who in turn would offer rigorous feedback and recommendations. 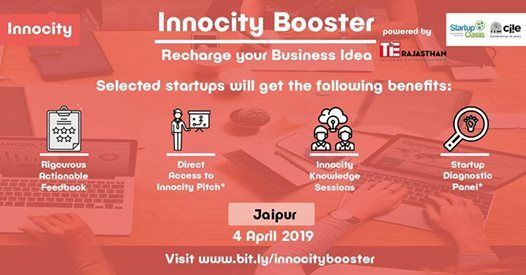 Post the Booster, you have the option of diving deeper through Innocity Business Clinics. If you are a startup based in Jaipur, at any stage and looking for above-mentioned support, we invite you to apply. There is No Fee for the event however, you have to register for it. Note: Selected startups will get the special slot of mentoring from the experts. Even if you are not selected then also you will be invited for the open session with the experts.